TORONTO, ONTARIO--(Marketwired - June 5, 2013) - The dream of an accessible and inclusive society and a cure for paralysis after spinal cord injury is still going strong, thanks to an investment by the Harper Government in the Rick Hansen Foundation (RHF). This support was announced today by the Honourable Steven Fletcher, Minister of State (Transport) and Member of Parliament for Charleswood-St. James-Assiniboia. "Our Government is proud to support this important spinal cord research," said Minister Fletcher. "Our investment will help translate promising research discoveries and best practices into practical benefits for the more than 86,000 Canadians with spinal cord-related injuries and illnesses." An investment of $35 million over five years will assist in the ongoing mission to achieve breakthroughs in spinal cord injury (SCI) research and treatment, generating new knowledge, new technologies and knowledge-based jobs, while improving patient outcomes and quality of life, and ensuring long term prosperity for all Canadians. Furthermore, this support will help with all elements of SCI treatment and care for newly, acutely and chronically injured individuals, including developing new therapies and decreasing the time required for research to be translated into real-life benefits. "Because of the Government of Canada's continued commitment, along with our valued partnerships, I can say with conviction that we are standing on the threshold of an exponential expansion on the boundaries of our SCI knowledge - progress that will lead to the realization of our vision of a world without paralysis after spinal cord injury, and will reduce the staggering costs of spinal cord injury on our health care system," said Rick Hansen. "The SCI Network, which has 31 sites across Canada, is the Rick Hansen Institute's number one accomplishment leading to improved treatment and improved mobility for many people with SCI." 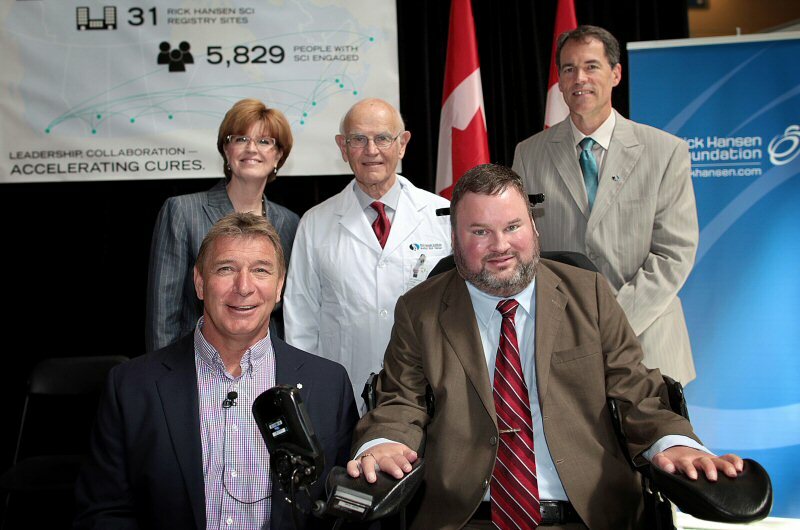 "This funding renewal is a major milestone for the Institute and could not have been achieved without the tremendous work of our clinical research network partners, and the tireless efforts of Rick Hansen and his Foundation on our behalf," said Bill Barrable, CEO of the Rick Hansen Institute, a specialized research and best practices entity designed to help improve health for people with spinal cord injury. "Today's announcement will have a far-reaching impact - not only for Canadians with acute and chronic SCI and our health care system, but for people around the world, and will further solidify Canada's reputation as an inventive, global leader in SCI research and care." Forging strategic long-lasting partnerships and positioning Canada as a leader in SCI research and care. Funding will also support post-doctoral scholars in SCI research areas as part of the 'Best and Brightest' program. "This federal funding, combined with provincial and private contributions, will enable the national network to bolster their research and clinical strengths and benefits," Hansen added. The Harper Government remains focused on four priorities, as outlined by the Prime Minister, that Canadians care most about: their families, the safety of our streets and communities, their pride in being a citizen of this country, and their personal financial security. Subscribe to news releases and keep up-to-date on the latest from WD or Follow us on Twitter. 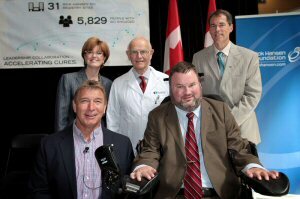 (Left to right): Rick Hansen, Co-Chair, Rick Hansen Foundation, Kathy Sabo, Senior Clinical Vice President and TWH Executive Lead, University Health Network, Dr. Charles Tator, Professor of Neurosurgery, University of Toronto, The Honourable Steven Fletcher, Minister of State for Transport, and Bill Barrable, CEO, Rick Hansen Institute celebrate the announcement of $35 million in funding to advance knowledge and treatment of spinal cord injury.